Hat and accessory boutique specializing in custom millinery. Metro Discount: Mention "Metro," or "Crenshaw Project," or bring a printout of this page to receive 20% discount on custom order. 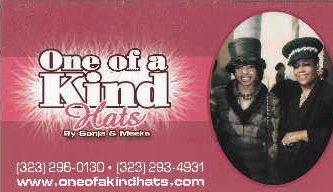 Go Metro: One of a Kind Hats is located at 3856 Crenshaw Bl. Find your best route with the Trip Planner. More Info: For information visit http://www.facebook.com/pages/One-of-A-Kind-Hats/251213898145 or call 323.293.4931.